CNG: eAuction 438. ITALY. Æ Sestertius (36mm, 23.90 g). Countermark applied during the reign of Vespasian, AD 69-79(?). 438, Lot: 338. Estimate $200. ITALY. 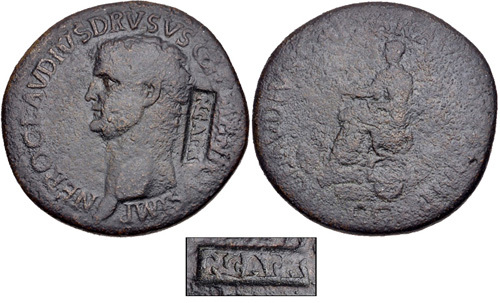 Æ Sestertius (36mm, 23.90 g). Countermark applied during the reign of Vespasian, AD 69-79(?). NCAPR (Nummus Caesare Augusto PRobatus?) in rectangular countermark on a bronze sestertius of Drusus. Pangerl 60. Host Near Fine, c/m VF, brown patina. From the Richard Baker Collection. Ex Numismatic Fine Arts [XVII] Summer MBS (27 June 1986), lot 1299 (part of).